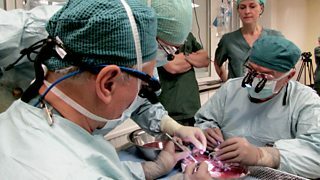 BBC Two - Trust Me, I'm a Doctor, Series 1 - Could a womb transplant cure infertility for thousands? Surgeon Gabriel Weston gets the opportunity to witness a pioneering operation, the transplant of a womb from mother to daughter – part of a research programme at the University of Gothenburg. ﻿The surgical team, led by Professor Mats Brännström, are carrying out 10 womb transplants, each a day-long operation involving a large team of specialists. If they can demonstrate the procedure is successful it could help thousands of women around the world. More than 15,000 women of childbearing age in the UK do not have a womb – having either been born without it (a condition that affects around 1 in 5000 baby girls), or having had to have it removed when young due to a condition such as cervical cancer. In the UK, surrogacy is legally complex, and in many countries (including Sweden) it is illegal, so a womb transplant is the only hope for hundreds of thousands of women around the world who wish to have their own biological child. A team in the UK are currently hoping to be able to carry out a trial involving 5 womb transplants some time in the near future. The 10 women in the Swedish trial who have received a womb transplant have to wait a full year before they can attempt pregnancy, but both the donor and recipient that we filmed have recovered well from the operation, and the recipient is now menstruating normally. The first women in the trial to have received a transplanted womb are now undergoing IVF and the team have undertaken the first embryo implantation. Over the coming months, more of the women will reach that stage and have embryos implanted and everyone will await news of the pregnancies with baited breath. Clip: Why, and how, do you transplant a womb? Surgeon Mats Brännström talks about how, and why, he is carrying out 10 womb transplants.